... and tried, and tried. 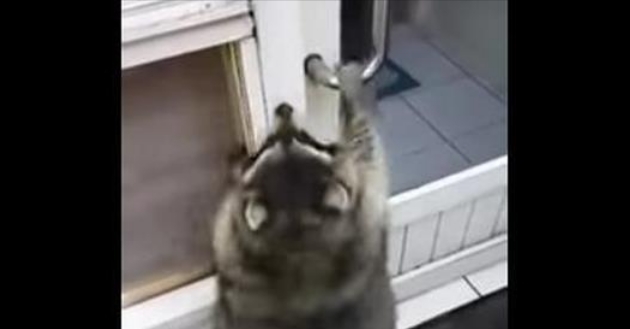 Whether the little raccoon was too short, or too chubby, or an adorable combination of both, he just couldn't open that door on his own ... though watching him try is pretty darn adorable. Finally, the raccoon convinced his friend that inside was best, and she picked up the chubby guy so that he could FINALLY reach the door. Friendship at its finest. It just goes to show that a little determination, and a little help, goes a long way. Bandit-masked raccoons are a familiar sight just about everywhere, because they will eat just about anything. These ubiquitous mammals are found in forests, marshes, prairies, and even in cities. They are adaptable and use their dexterous front paws and long fingers to find and feast on a wide variety of fare. Responses to "Chubby Raccoon Is Trying Really Hard To Open This Door "